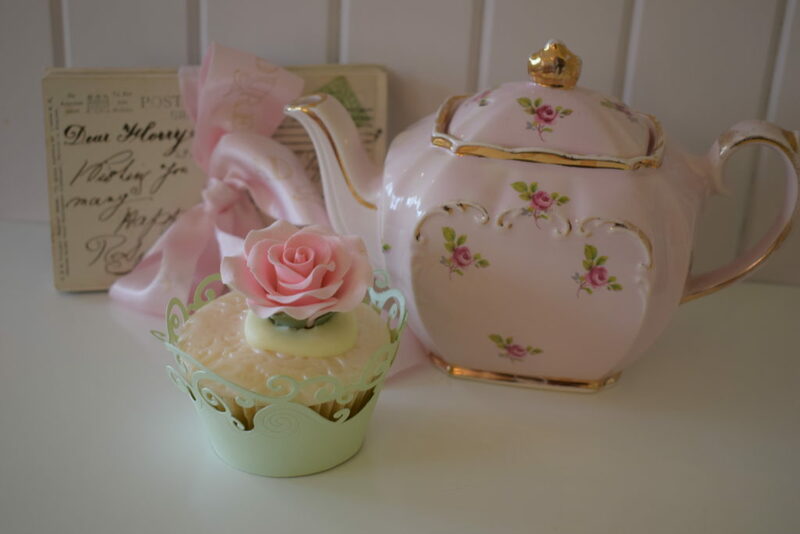 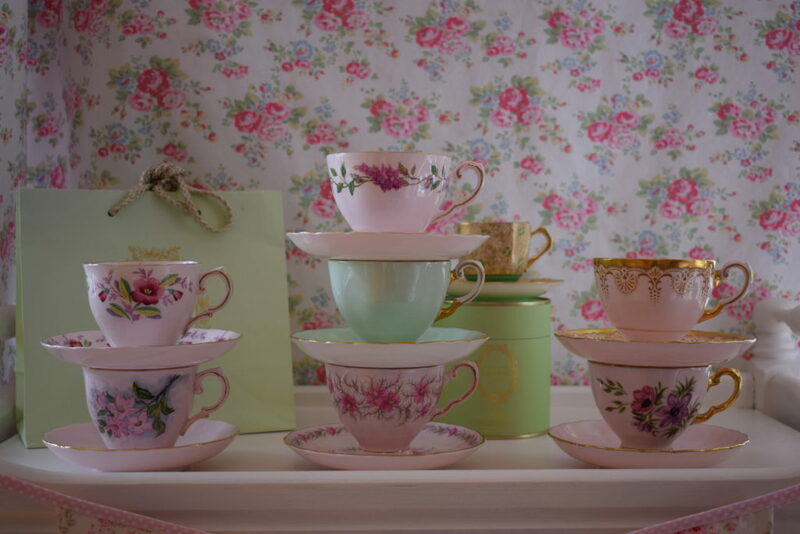 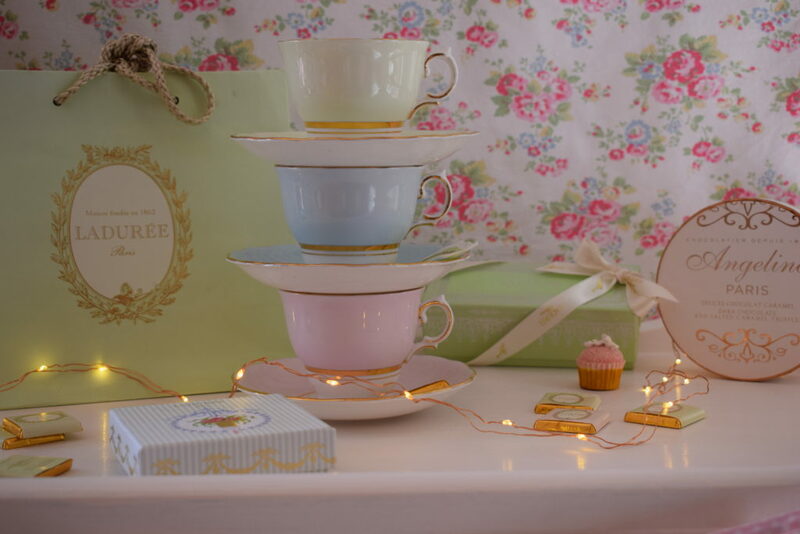 My love of pretty florals and pastels is evident in my vintage china collection and I do have definite favourites! 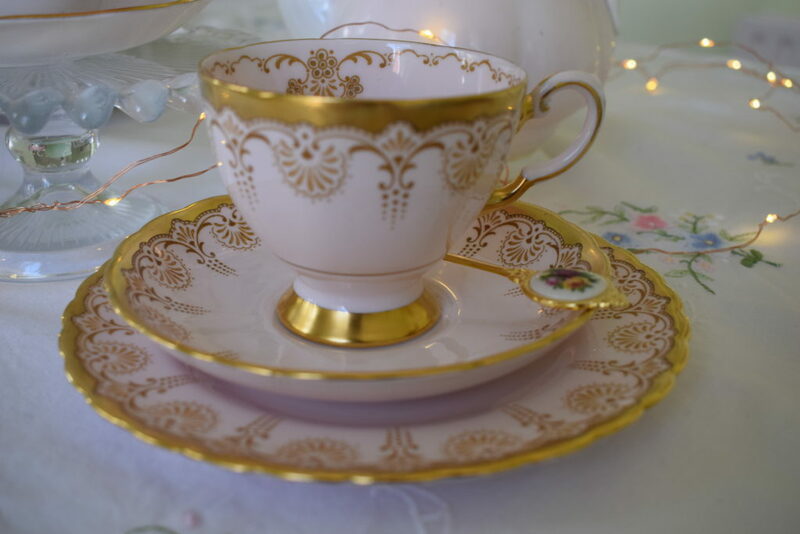 When clients come to see me regarding styling and hiring items for their special event one of the first things that they usually like to do is pick out which style and colours of teacups they would like to use. 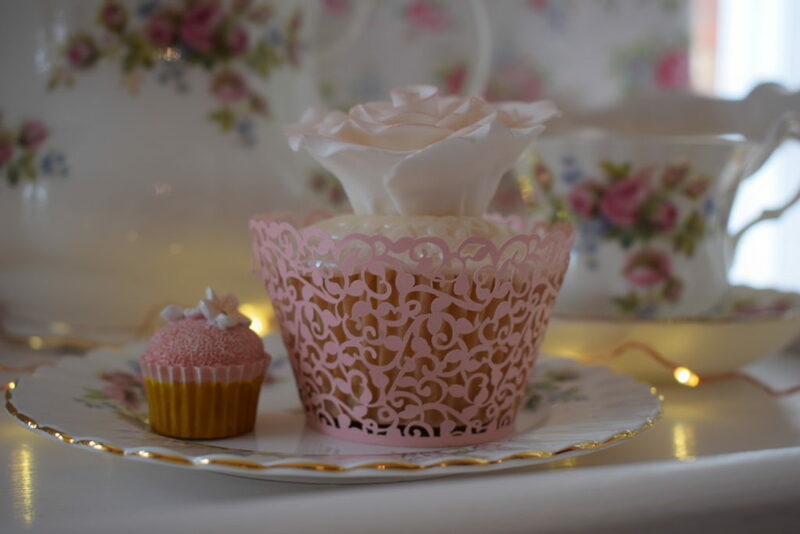 This is especially true of brides who often like them to tie in with bridesmaids dresses and flowers etc. 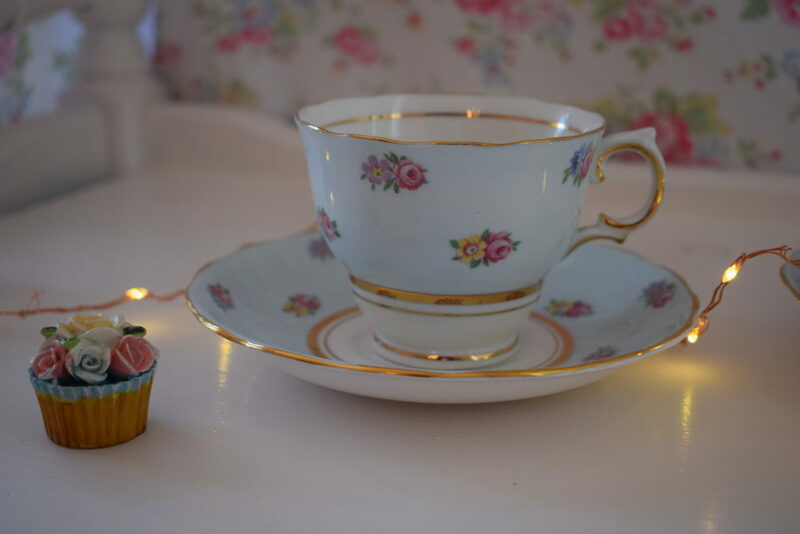 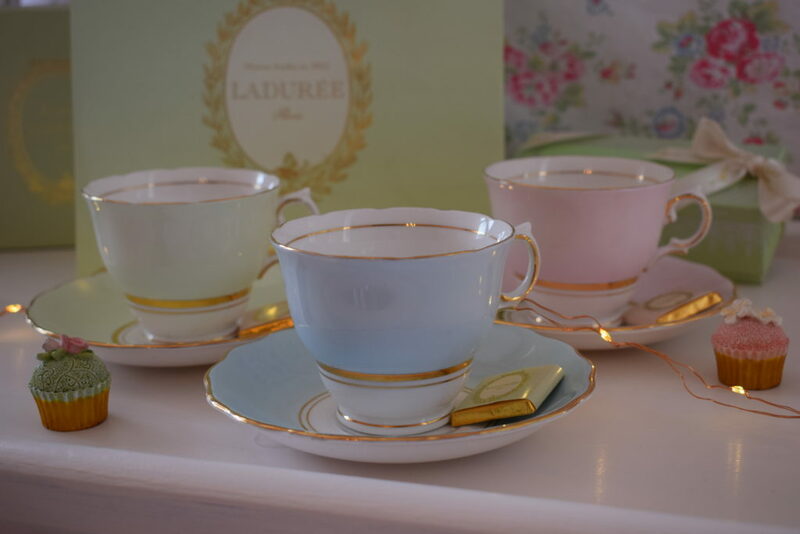 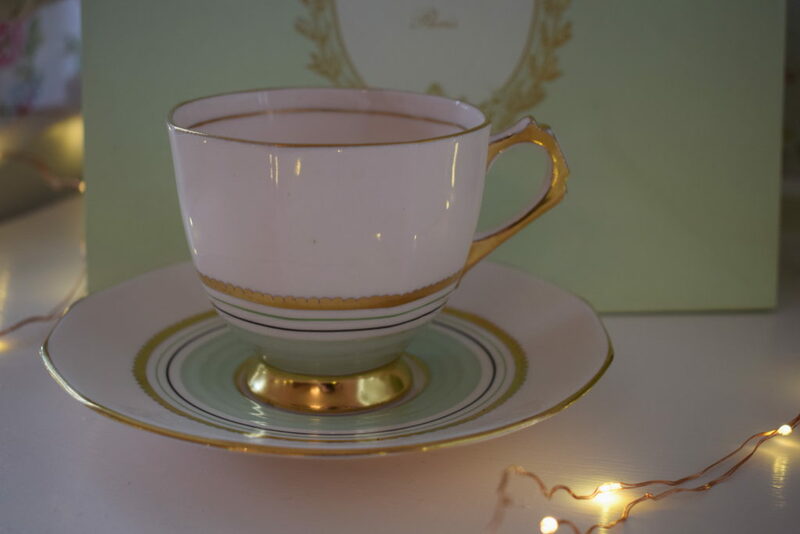 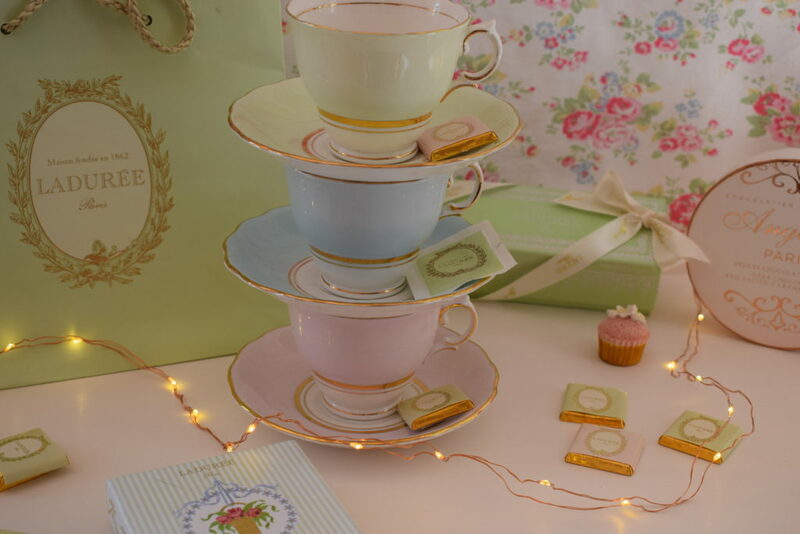 Colclough vintage china can be found in gorgeous sugared almond pastels and these dainty little teacups are a firm favourite. 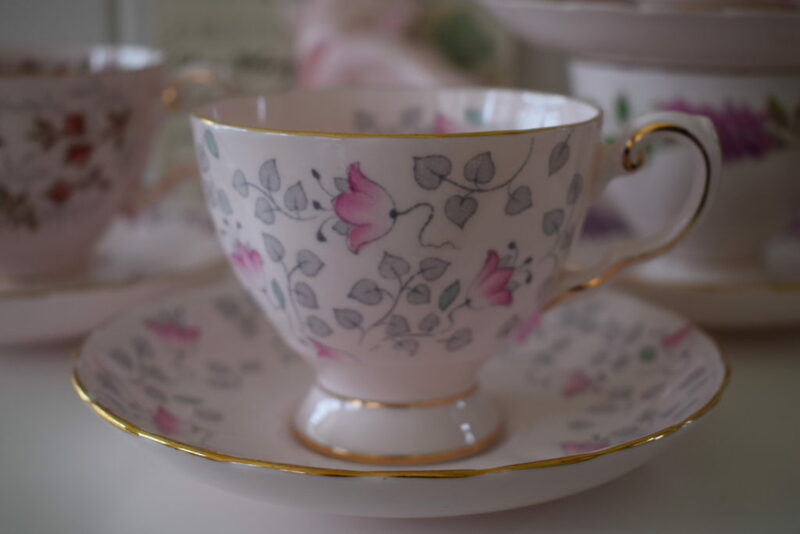 I’m especially fond of the ones known as ballet shaped which can be found with delicate floral patterns or in plain pastels. 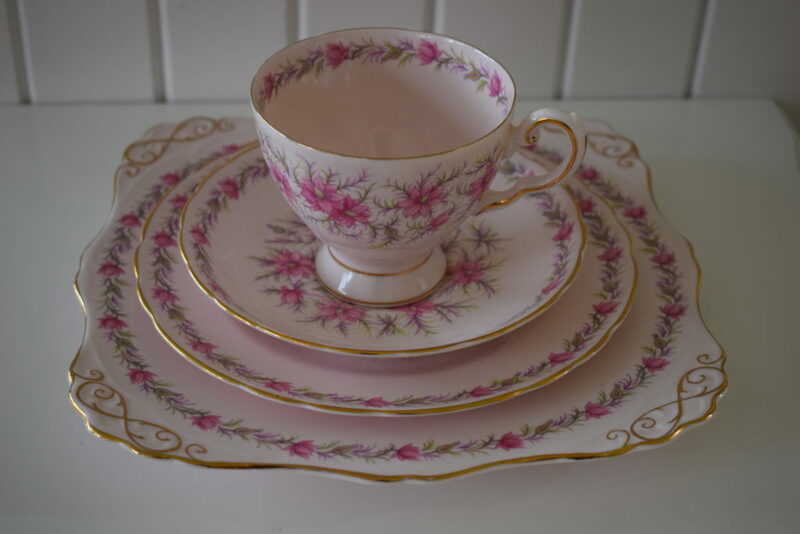 Pink Tuscan china is very beautiful and elegant and is a big favourite amongst collectors of fine china and I have built up a large collection of it over the years. 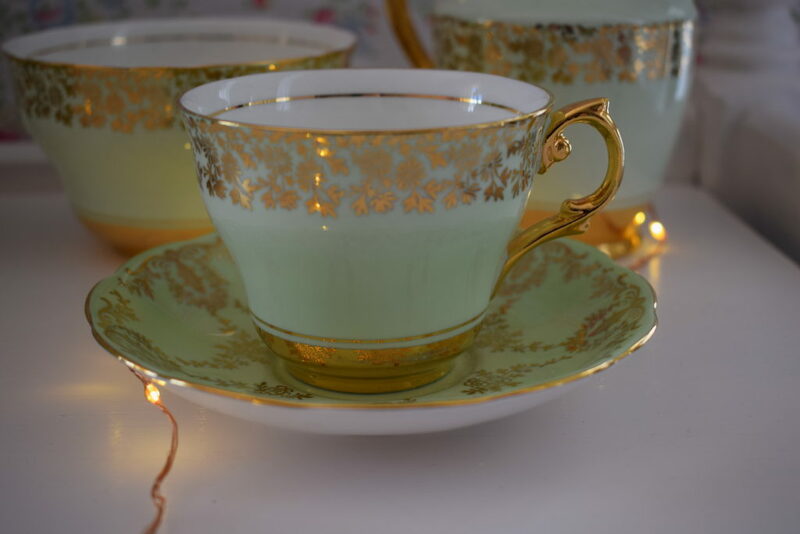 My sister recently picked up a gorgeous green set for me in our favourite antique shop in Scotland which I was thrilled with as it appears to be even more difficult to find than the pink. 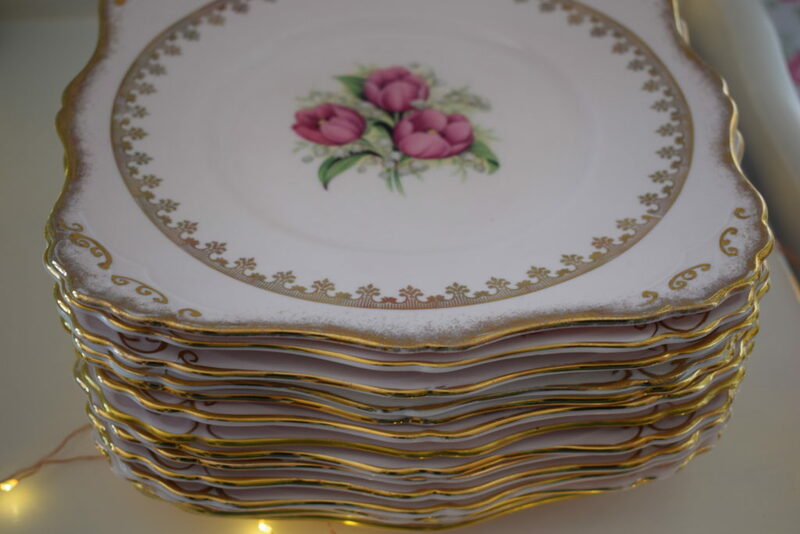 It comes in both plain pastels and delicate florals with gilt trim and looks stunning as part of a table setting for a party or wedding. 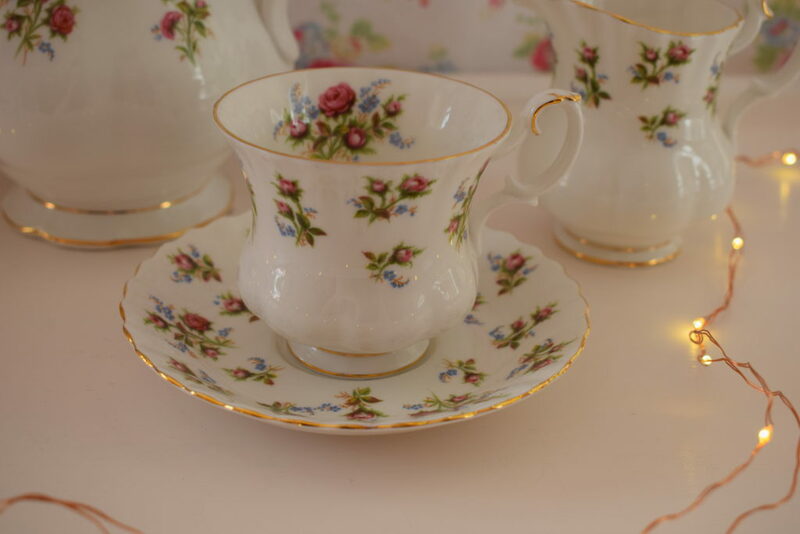 Another big favourite with clients are the distinctive florals from Royal Albert. 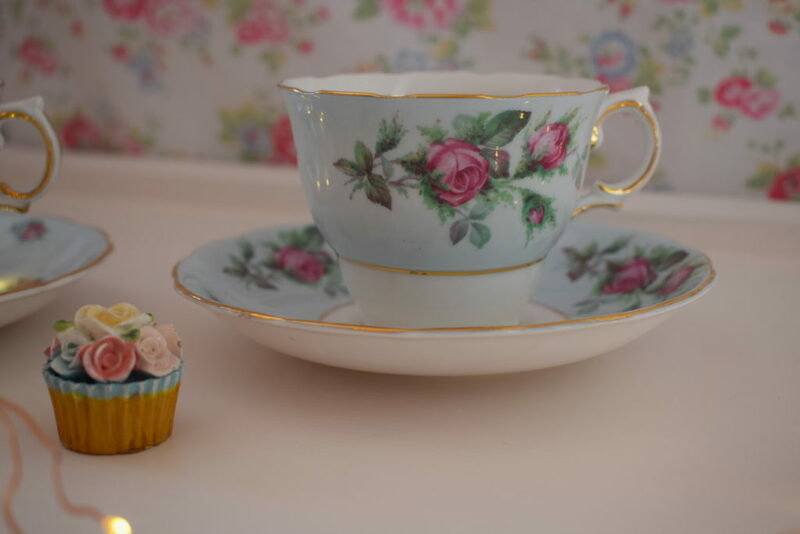 I received quite a bit of Royal Albert china in wedding gifts as it was very in vogue around that time, 28 years ago, and I did love it at the time and still have the full set of the blue Moonlight Rose and Old Country Rose which are still favourites with collectors but they wouldn’t be my typical choice of colours. 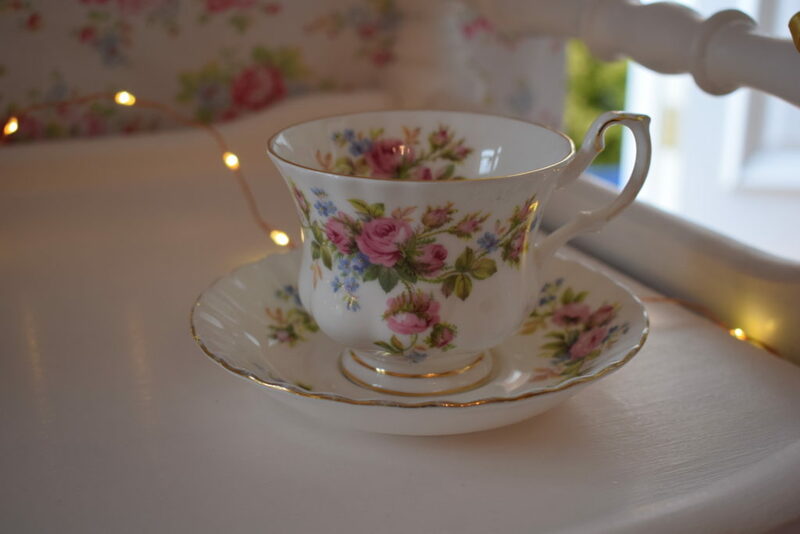 I do however love Royal Albert’s softer florals such as Winsome, Moss Rose and Tranquility and these are very popular for all occasions. 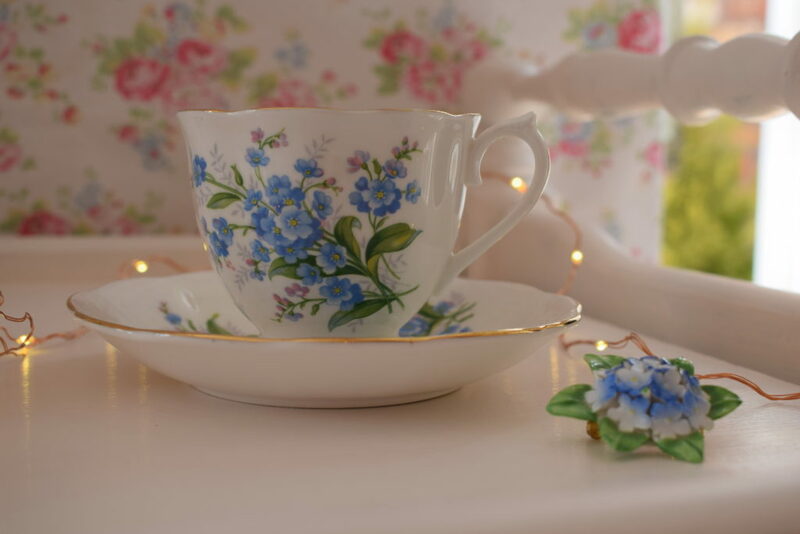 The forget-me-not pattern is particularly pretty and I found it on ebay to use at at some Alzheimer’s Society events which I worked on, as the forget-me-not is the symbol for the charity. 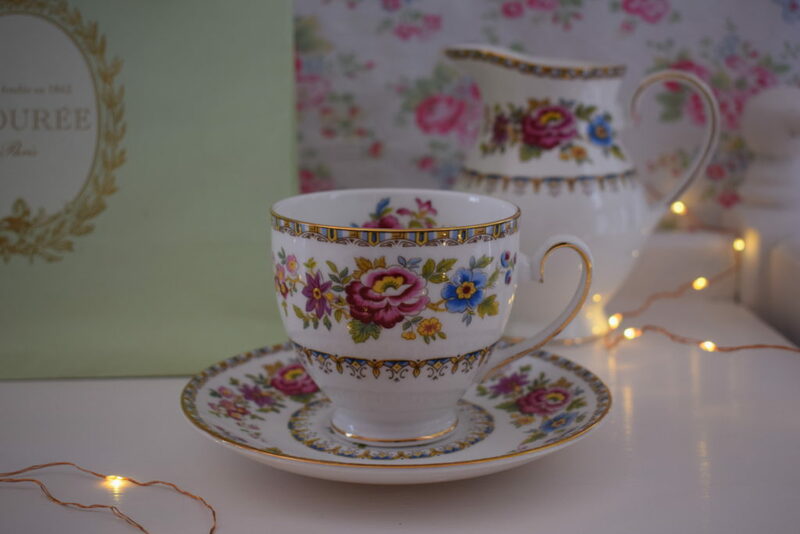 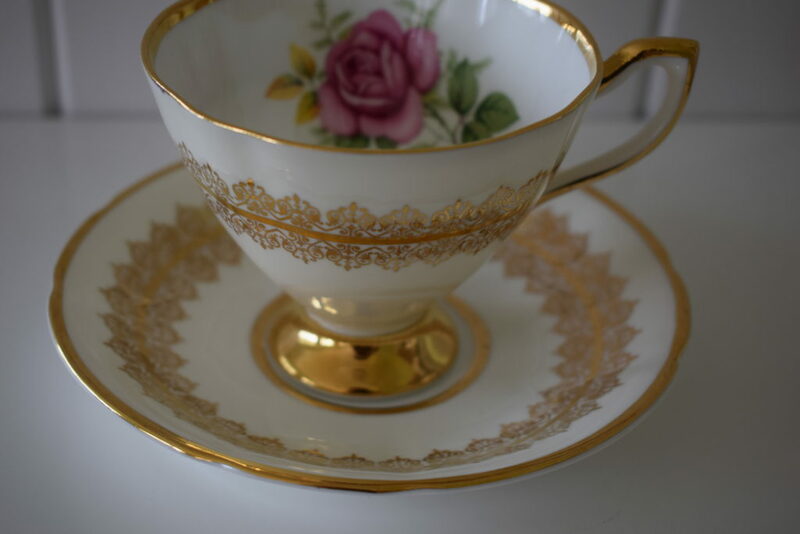 Clare china is particularly beautiful and I have only managed to find a few sets of it and I was quite distraught when two of my favourite cups were broken at an event as I have found it impossible to track down replacements. 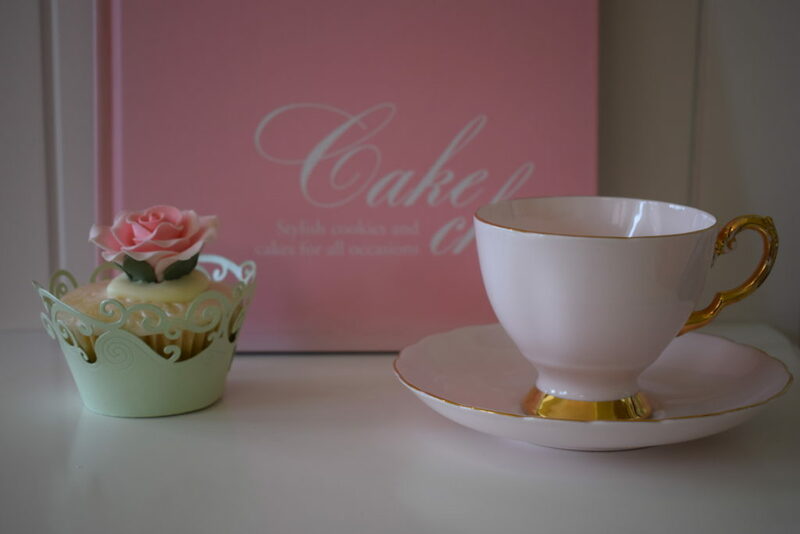 However these things happen and if things do get broken it’s not the end of the world! 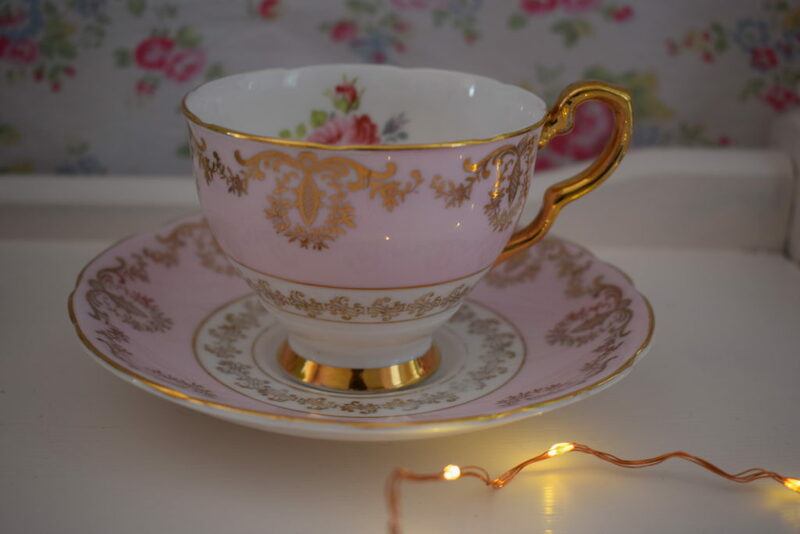 I have lots of different sets in pinks and greens as this is my personal favourite colour combination and it is also hugely popular with clients. 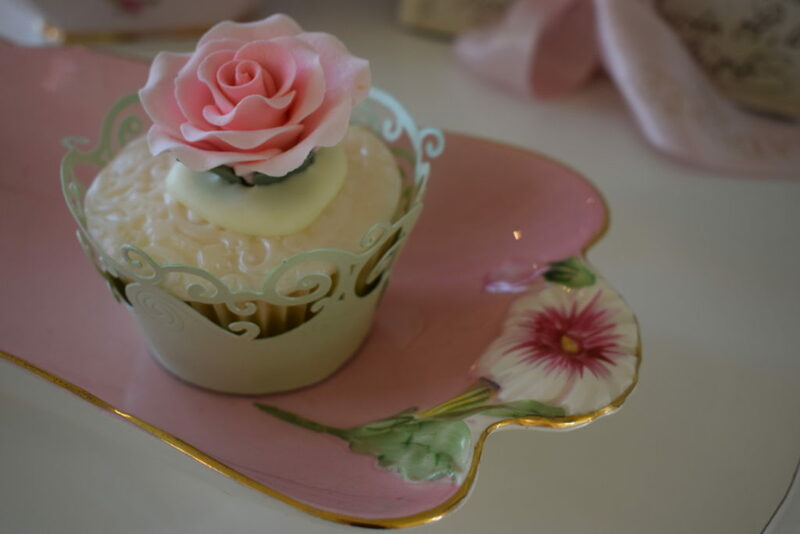 They are of many different makes and designs but compliment one another perfectly when set out for an event. 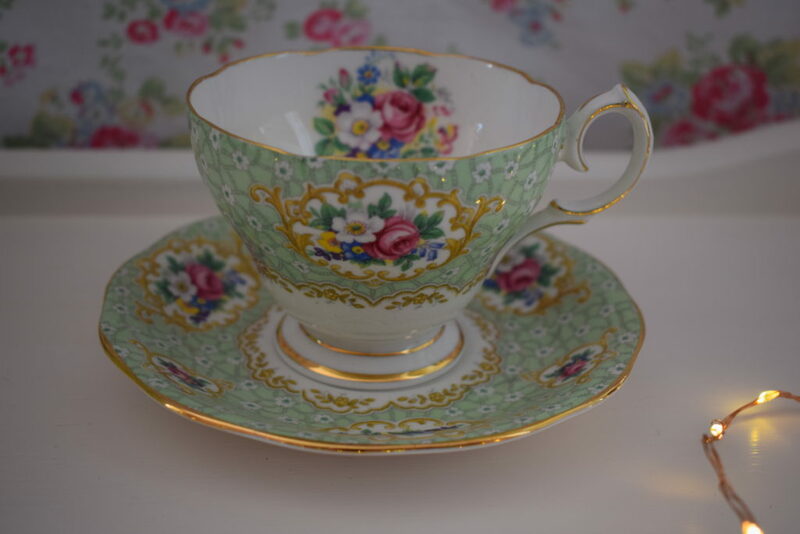 Royal Grafton florals are also very popular especially their beautiful Malvern design which I have a full set of. 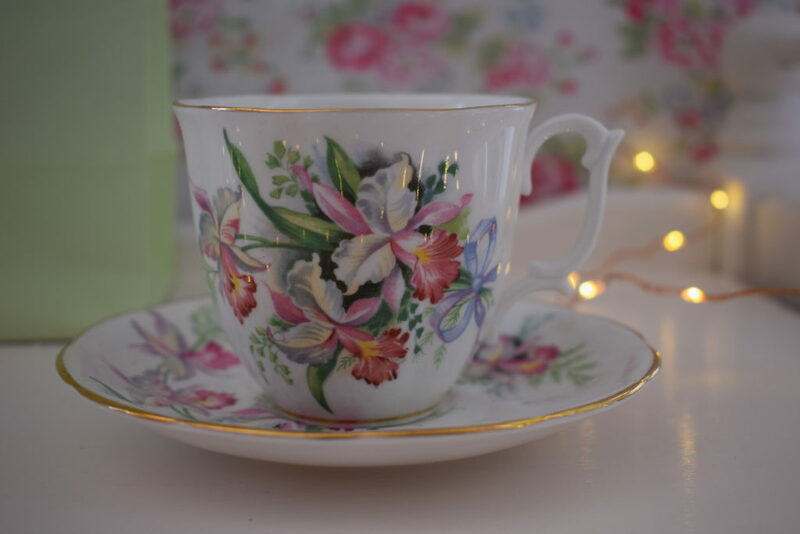 The designs are beautifully vibrant florals and are popular for wedding anniversary parties and special birthday celebrations. 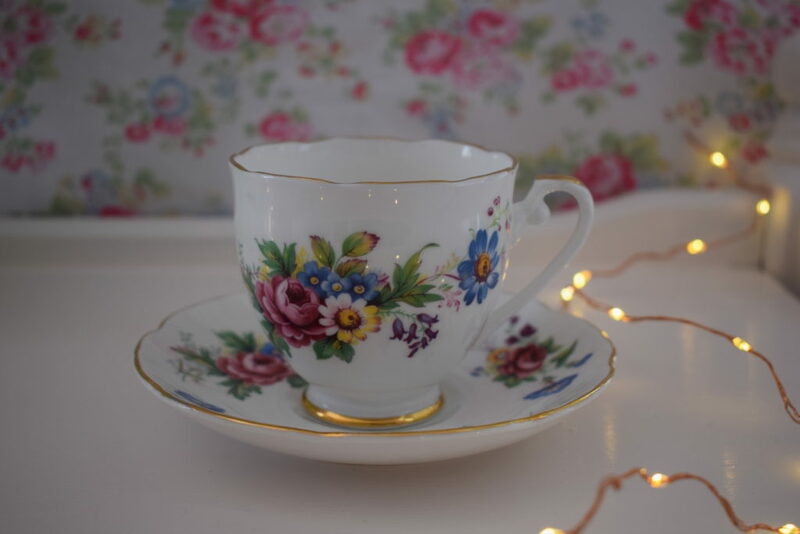 Hope you’ve enjoyed this little glimpse into my vintage china collection which of course is available locally for hire for weddings and events. 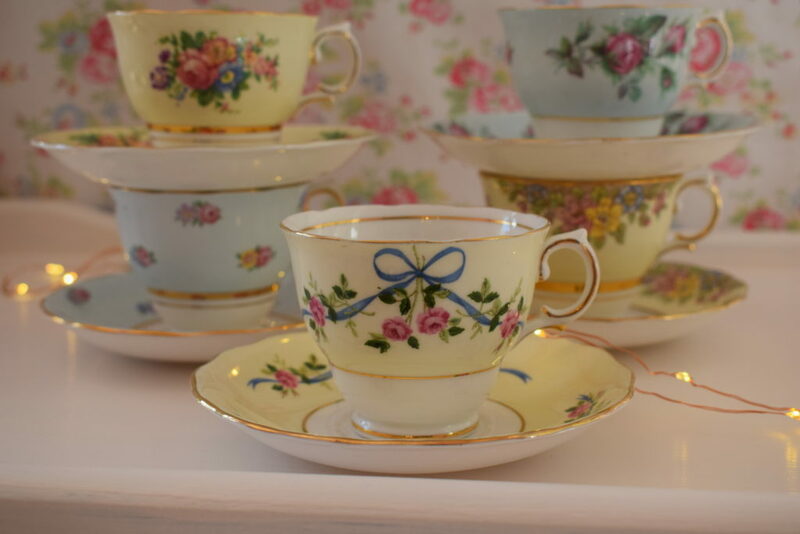 This is just a small selection of what we have but gives a general idea of what our extensive collection is like. 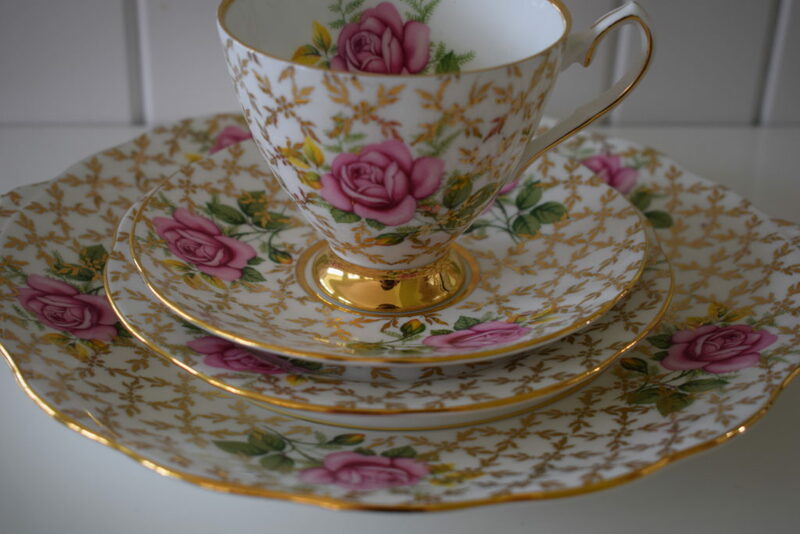 I m in love with this China.The most beautiful elegant sets i have ever seen.